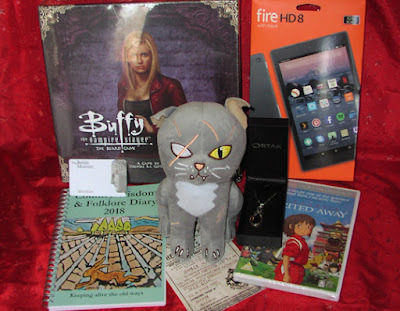 A bad witch's blog: A Huge Thank-You for My Yule Presents! A Huge Thank-You for My Yule Presents! I know I've been lucky this Yule. I was given some amazing presents and I want to say a very big thank-you to my friends and family for making the Solstice wonderful in so many ways. The gifts I knew I was getting were a new Kindle and the Country Wisdom and Folklore Diary 2018. I'd asked my hubby for an Amazon Kindle Fire because my old Kindle - which he had bought me back in 2010 - was no longer working that well. I also knew he had bought me the diary at Treadwell's. I wasn't expecting to be given the new Buffy boardgame, British Museum membership, a DVD of one of my favourite movies - Spirited Away, a plushy Greebo the cat from Terry Pratchett's witches books and some beautiful jewellery. A few things that didn't make the photo above were chocolates, booze and a set of bubble bath containers in all the colours of the chakras. I am so grateful for the presents - but more grateful for having such lovely friends and family to spend the Yuletide with. I know there are plenty of people who have to spend the holidays alone - particularly the elderly. One of my resolutions for 2018 will be to try to do more to raise money for charity and to help in other ways.